Many many thanks to the wonderful Mike Thayer (@mthayer_nj) who sent a link to this lovely video https://www.youtube.com/watch?v=XFDM1ip5HdU in response to yesterday’s post. We started each Calc BC class today by revisiting the rational function that caused me so many problems yesterday. Innocently enough, I decided that it would be interesting to examine 1/(1-x) first by long division where the divisor is 1 – x and we got the power series 1 + x + x^2 + x^3 + … as the quotient. Then, we used -x + 1 as the divisor and got the series -1/x – 1/x^2 – 1/x^3 – 1/x^4 … as our quotient. Class ended too soon and I was not able to answer the question of how we could consider these two very different looking series as being equal to each other since they were each results of considering the rational function 1/(1-x). So, after sending out my call for wisdom in yesterday’s post I went to GeoGebra and discovered something lovely. Something that I was sure my students would be able to discover for themselves. I created a GGB file and I planned our day today. Can I tell you how proud I am of my students for how they handles today? Well, I won’t wait for your permission, I will just come out and tell you how thrilled I am. What my students realized – what I realized last night – is that the two series we can generate have completely opposite intervals of convergence. It was absolutely lovely to see geogebra help this intuition along and it was fantastic that they made this realization before seeing the second graph to confirm it. After this breakthrough we watched the video together and all of our brains were a bit achy by the end. Amazing that Mike found/knew this link so quickly when I blogged last night. Some other notes – A student in my after lunch class made this observation about the complementary nature of the intervals of convergence before we even looked at geogebra. I gave one last example, f(x)= x^3/(x+5) and the student who was bothered by -1 = 1 + 2 + 4 + … quickly converted x + 5 into a form of 1 – r so we could interpret the rational function as an infinite geometric series. Another student converted it to x^2/(1 + 5/x) and we, once again, had two different series’ that had complementary intervals of convergence. I have taught this course five or six years before this and never had this ‘discovery’ pop up. Now, we cannot avoid it. It provides a wonderful context for our upcoming conversations about Taylor series and it gives us the opportunity to be more aware of convergence expectations. A pretty great day! Today we returned to school after a too long two week spring break and in Calculus BC we are beginning to engage with power series ideas. I decided to borrow and modify an exercise in our teacher resources binder. The text presents a definition of a power series and draws comparisons between them and geometric series. I decided to present four series examples and four answer choices – A) Geometric Series B) Power Series C) Both D) Neither. My idea was to show the answers without the definition first and draw out a definition from those clues. That part of class worked pretty well. Then I dipped into turning a rational function (f(x) = 1/(1-x)) into a power series with a brief discussion of why we would even want to do such a thing. I showed them that this function is equal to 1 + x + x^2 + x^3 + … in three different ways. But before I could launch into this conversation I was challenged by one of my very talented students. He said that this equation could only be true if -1 < x < 1. I replied that this was a condition for convergence of an infinite geometric series but I did not want to wander into a conversation (yet) about radius of convergence so I tried to put off that conversation. To his credit he asked me to explain the equation if x had the value of 2 which would then mean that -1 = 1 + 2 + 4 + 8 + … I did my best to congratulate this observation while still holding off a bit on talking about the radius of convergence. So, I showed the comparison to the sum formula for an infinite geometric series and then I multiplied each side of the above equation by the denominator 1 – x showing that the series on the right telescopes into 1. Then I got myself in trouble. I did a long division to show that 1 / (1-x) expands into the infinite series. However, when I was writing notes to myself earlier int he morning I thought that my students would question why I was writing the divisor in the form 1 – x. Students are SO used to seeing expressions in a more standard form of -x + 1, so I also did the long division that way. Well, the result of the long division is pretty radically different. Instead of 1 + x + x^2 + x^3 + … the result is now -1/x – 1/(x^2) – 1/(x^3) -… I was pretty surprised by this and I thought that it was important to share this surprising difference. Well, I would have felt better about that decision if we had had about 5 more minutes to talk. Instead we were faced with the end of class and my students asked if these two drastically different expressions should be considered identical. I conferred with another calculus teacher at my school and he was pretty surprised/intrigued by this conversation and pressed me a bit on why I wanted to open that door of rewriting the division. He also pointed out – as I should have – that the second response is not a power series since it has negative exponents. If I had pointed that out before class dismissed I would have felt better about our conversation. I need to do some thinking about how to talk about this tomorrow. Hey internet – any words of wisdom about this? As I wrote about the other day, I tried something brand new with my Geometry kiddos this week. I had found online somewhere recently a three day packet exploring reasoning and proof (you can find it here) and I had my students in small groups. I had three groups of three and one group of four (I know, I am very lucky (spoiled?) to have such small classes) and they all grappled with one of the open problems in the set and gave brief presentations on Tuesday. Yesterday we conducted a fishbowl discussion. I had never done this before as a teacher or as a student, so I felt a little anxious about it. Since I had not taken the time to ‘train’ my class, I left this as a pretty open exercise. There are two pages of definitions to grapple with in the handout linked above. I had seven students in the fishbowl for the first round and I joined the other six in the fishbowl in the second round. Every student drew a card at random as they came in to decide which group they were in. I instructed the outside group to just quietly observe rather than to take notes on the inside participants. Both rounds went pretty well – in my opinion – but what was best about the day was the talk at the end looking back on the exercise. 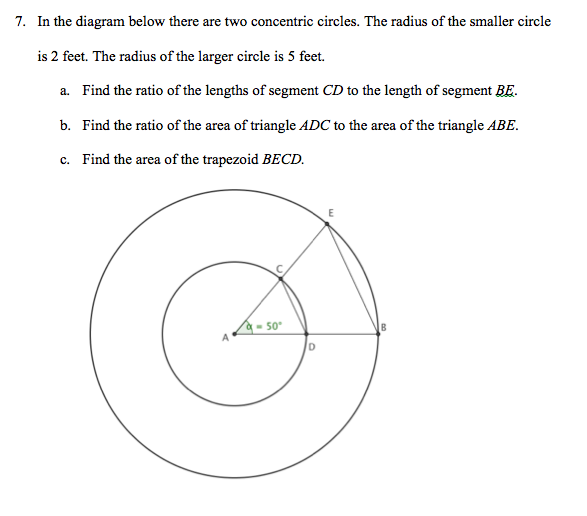 I have tried to make this first week back for Geometry rather open – ended. I wanted to try and make some important points about learning, and about classroom culture, about proof and logic. I wrote already about the frustration one girl expressed during the spaghetti exercise where she wanted A right answer to the exercise. I took that opportunity to talk about different approaches, to try and emphasize our desire for efficiency when we can find it, but, more importantly, my desire to hear their voice and thoughts not just an echo of my voice and thoughts. They get too much of that from adults already. Yesterday as we reflected on the exercise two girls shared really interesting observations. One said that when she was inside the fishbowl (I was outside at the time) she felt really anxious about saying something out loud that might be wrong. She said she was more relaxed when she was outside but she felt she understood definitions better when she was inside. This is HUGE. This kind of self-awareness is so important. I asked her to think about that and think how she can use that realization moving forward in our class. I hope that she decides that she understands better when she is more actively engaged in the conversation around her. The other girl remarked that she knew that she understood better when she talks and I seized on that and challenged her to make talking in class a real commitment. It’s been fun to be back – our school’s last full day of classes before this week was November 12. I appreciated the rest (other than grading finals – a post for another time) and I am glad to finally be prepared in advance for all three of my courses, but I sure did miss the interaction of the classroom and I have been thrilled with how my Geometry students (my youngest class) have come back ready to go. I have asked them to deal with different situations than they normally do and they played along beautifully. I am so pleased and I hope that we have made some important points about our time together. I also hope that I can hold myself to the most important lesson I learned this week. Unfortunately, it is one I have ‘learned‘ numerous times – my students are better off when they speak more and I speak less. I need to make this my mantra – especially if I want to effectively integrate some other changes in my classroom in the upcoming new year. That’s right, I do not want to let myself wait until August, 2016. I want some serious changes as of January, 2016. I have not been writing here as much as I want to because, for the second year in a row, I am creating daily HW problem sets on the fly for a new class. This summer, with about two weeks left before school began, I found out that a colleague had taken another job. She had a fantastic opportunity that she felt she could not pass up. One of the side effects of her decision was that I inherited an extra section each day and I inherited a new course – Discrete Math – meeting twice a day. I am still feeling my way through it but I have a wonderful group of students. One section has seven students and the other has eight. We have been sitting around a pod of desks together sharing ideas. I think that this has been a bit of a culture shock for some of the students but I am thrilled with their flexibility. This elective was introduced last year and we are feeling our way through it. The students in here are not necessarily great math fans and I wonder whether many of them are used to feeling that their mathematical opinions are particularly pertinent. I have been working hard to develop an atmosphere of trust where the students are willing to share their opinions, their answers to questions, and, most importantly, their questions for each other and for me. I have been thrilled by the level of engagement and today, in each class, students offered explanations to a probability idea that just knocked me out. We are just introducing the ideas of compound probabilities and talking about how to interpret AND versus OR situations. For example, I offered an example telling the students that approximately 10% of American adults are left-handed. I asked what was the likelihood of two randomly selected adults both being left-handed. Students quickly offered the idea that 10% of 10% was the way to go. A different problem outlined percentages of blood types and mentioned that type B people can accept donations from type O or from type B. Here, the students quickly offered addition as the way to work through the problem. I congratulated them for seeing this quickly, but challenged them as to why they had this gut feeling. One student in my early class said that he thought of the two left handed people as one event where one thing happened then another, while he thought of the blood type question as two ways an event could happen. I was so pleased to here this developing intuition. In my later class the same scene unfolded and here a student simply offered the idea that two blood types gave you more opportunities so we want to combine them in a way that increases the result while the left handed question seemed to necessarily narrow the likelihood of being satisfied with the result. I find both of these explanations to be much more appealing than tree diagrams or a simple rule that AND = multiply while OR = add. On the heels of learning some right triangle trig I am really trying to develop more proportional logic with my students. Just this week we had a really productive conversation about the following problem. I’m trying to process this and figure out what it might mean for my classroom practice. I understand that I should be more excited by my students’ ideas than they often are. I understand that I will remember context of conversations more easily than they will because I am not dealing with the cognitive load of trying to learn/understand the conversation. I am simply coming at it from such a different place. What I don’t understand is how a student can be so in command of an idea but then not remember the creative process that made her arrive at this clever conclusion. I discussed this in the faculty lounge right after Geometry today and one of her other teachers intimated that this might simply be modesty on her part. I am not sure how much faith I put in that reading. So, while I am a bit frustrated and confused, I am choosing to focus instead on the positive energy of yesterday’s conversation, on the clever ideas that my students brought to the table, and on the fact that my students did a really nice job on their quiz today. When I last dropped by my own blog here to write I was cooking up an idea for my AP Statistics class. I wanted to write a good activity to explore data using my FitBit. I was lucky enough to win a FitBit Flex in a raffle and I’ve been fascinated by it for the past month. I had four volunteers who also shared their FitBit data with me and I put my data (identified) with the data of my four brave volunteers (not identified) and developed what feels like a pretty good activity. Yesterday I displayed my data in an EXCEL sheet before deciding I was better off in a Google sheet. We looked at my data together and with Desmos open we transferred some data two columns at a time and looked at lines of best fit. We tossed around some questions that seemed interesting, we questioned some of the data presented (especially the first data line on the sheet identified as Doherty Data), we made guesses about what relationships were hiding. We discussed the impact of height and weight and just generally had a pretty good time noticing and wondering together. Last night I combined all the data into a Google sheet (which can be found here) and I condensed some of the questions that came up yesterday and wrote them up on a Google form (which can be found here) and today I just set my kiddos loose. We have access to a computer lab so everyone had their own space to work. I dealt cards at random to spread the sheets around, I wandered and answered questions about moving columns on google sheets and how to make Desmos (like this graph) work its regression magic. I had discussions about resting heart rate, about whether calories burned or active calories were more interesting to look at. We remembered the dangers with extrapolation when discussing the y-intercept of these regression equations. We tried to figure out which mystery person might be taller or which one might be heavier. There is real joy in listening in on these conversations, but my biggest highlight today is that I got to show off the spirit of my classroom to a visitor today. He remarked on what a treat it was to witness ‘sense-making’ in action. I want to revisit my questions and make them better next time around, but I am pretty pleased so far. Tomorrow, we’ll start class with about ten to fifteen minutes to wrap up this activity and then we’ll share our discoveries with each other. Right now my AP Calculus BC class is taking their final test of the term. I hope I am as happy grading those as I am thinking about my AP Statistics team right now. A number of years ago I was fortunate enough to be able to attend the Ajna S Greer summer conference at the Phillips Exeter Academy. In addition to great mini courses, terrific connections, lovely food and drink, and just general all around wonderfulness there I was exposed to their Harkness table teaching. I had long struggled with the traditional rows and desks layout of my classroom and I remembered how I would utilize it as a way to hide as a student. Being relatively small in stature I was able to disappear into the classroom seating arrangement when I did not want to be engaged in class. As a teacher I want to avoid that. At my last school our desks were very moveable and I played around with a ‘pod’ system in my classes. The girls took to this system (it was a single gender school) and they took a certain amount of ‘pod pride’ in their group work. I played with group quizzes and I was feeling like I was moving forward as a teacher. I still found myself a bit frustrated by the lack of whole group interactions. I came to my current school in the fall of 2010 and inherited older desks that were not so flexible in their use. So, I prowled around campus looking for solutions and I found some old library tables that were sitting in a storage room on campus. My boss got our maintenance drew to help and over christmas break I removed all individual desks from my room replacing them with six rectangular tables. When my students returned they were taken aback by this new set up and by the new classroom behavior expectations I put before them. I simply asked them. I told them that it was understandable if I was the person who talked the most in class – not always desirable, but understandable – but my challenge to them was to make sure that my voice was not heard more than 50% of the time. I wanted them to talk to each other. I wanted them to toss out ideas and questions. I want them to interrupt me and to share their ideas. I want them NOT to interrupt each other when ideas are being voiced. In general, I wanted them to be active participants in the classroom not passive vessels waiting to be filled. I am the only math teacher in my school who has a room set up this way so when they get to me there is a learning curve. I encounter a number of different situations as they learn how to be a student in my class. There are social conversations occurring. More of them than there used to be. I wish that there were fewer of them, but it’s a price I’m willing to pay. There are students who are not sure enough of their ideas to share them with the class. So they try them out on their neighbors instead. I try hard to listen and pull those ideas out and toss them to the crowd. There are students who are distracted by their neighbors and want to just focus on me. I try to move people around so that this effect is minimized. The physical layout of my room means that some students have to turn around to see certain boards. I don’t know how to fix that and I am not sure it is a critical problem. Some students monopolize the class conversation. This used to happen anyway. I think that now I at least have the benefit of students making eye contact with each other. It is easier to listen to your classmate if you are not staring at the back of her head. Some students are quiet and more shy. I get that. I watched the TED Talk from Susan Cain about introverts. In fact, I shared it with my class and talked about the impact of the classroom set up. We had a great conversation about it. I know it’s not a perfect setup for everyone but I also hear back from my students that this setup has helped them put their own voice to their mathematical ideas. I have had students tell me that before my class they thought that their job as a math student was to know how to use certain formulas and know when to use them. After my class, I hope that they have a larger view of their job in the classroom. There is a learning curve at the beginning of each year and I hope that we are beyond it now as we head to week 7. I feel that I am more aware of my students and that I have a better sense of their level of understanding. I think that my students get better everyday at listening to a variety of voices in the classroom. I still spend too many days doing more than 50% of the talking in class but I think that I am still on that learning curve myself. I would not be so bold as to say that I am implementing Exeter’s Harkness style the way it is intended, but I think that I have found a way that makes sense inside my school.